Home prices locally are soaring at the fastest rate in 3 ½ years, as competition for few available homes has heated up during the peak buying season. For the eighth straight month, Seattle is the hottest housing market in the country, with families looking for starter homes hit particularly hard by rising prices and a shortage of houses for sale. The typical single-family house across the Seattle metro area cost 12.9 percent more in April than a year ago, according to Tuesday’s release of the monthly Case-Shiller home price index. Portland was second, at 9.3 percent. The last time local home values grew this quickly was October 2013, and the annual increase in prices is nearing a level not seen since the bubble years before the recession. Nationally, home-price increases are slowing down a bit, and grew 5.5 percent from a year ago. Seattle home prices are growing 2.3 times faster than the U.S. average. 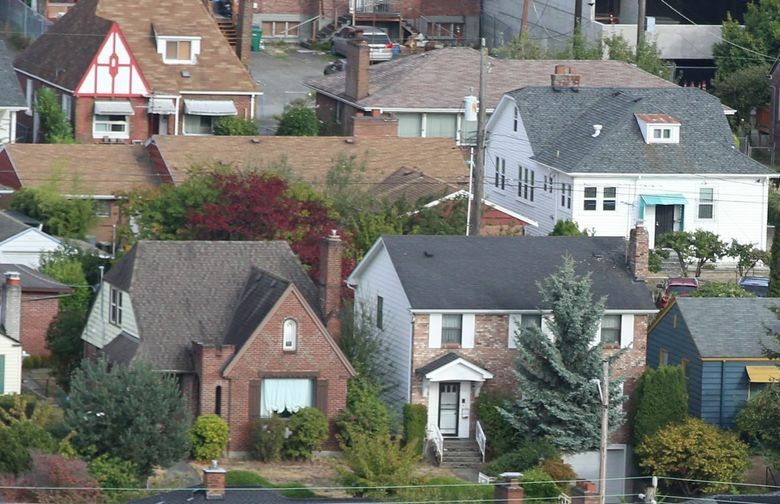 Seattle has led the nation in home-price growth every month since September. But since then, the gap between Seattle and other cities has only grown, suggesting it will be a while before Seattle relinquishes its dubious title. 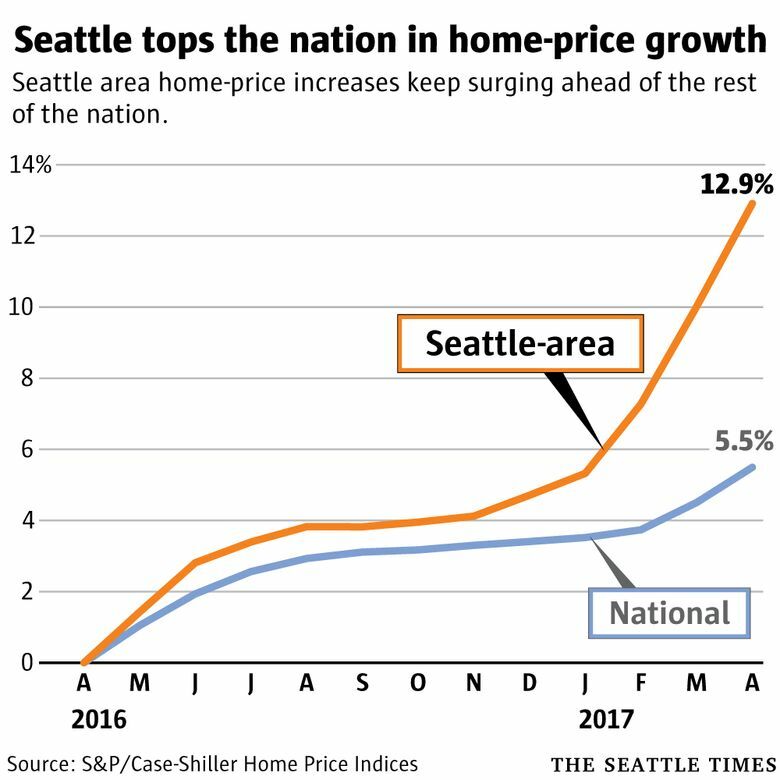 Compared with just a month ago, Seattle prices jumped 2.6 percent, easily the most in the nation. The continued price increases from the past half-decade continue to limit access to homeownership. The median price of a house in Seattle is now $729,000, and it’s $875,000 on the Eastside, while prices are now at record highs in Snohomish, Pierce and Kitsap counties. Five years ago, the typical family looking for a starter home had to spend one-third of its income on a small house in Greater Seattle, according to Trulia. Now, the typical starter home here requires half of household income for those buyers. The price of starter homes — generally the cheapest one-third of homes on the market — has nearly doubled in that span while incomes have not come close to keeping up. At the same time, the number of starter homes on the market has dropped in half since 2012. Here’s another way to think about it: The average millennial here would need to save up for 14.5 years just to afford a 20 percent down payment on the typical small starter house, according to new research from the rental website Abodo. That assumes millennials are able to sock away 15 percent of their income each year, which may prove difficult for some given the soaring rents here. Only 29 percent of millennials in the Seattle area own homes, among the worst rates in the country. Young adults own about 9 percent of the homes here. The Case-Shiller data shows starter homes have been the hottest segment of the market for a while, with prices surging 85 percent in the past five years, compared with 63 percent for top-tier homes. The Seattle area is tied with the Denver region for the fewest number of houses for sale, relative to market size, in the country, according to CoreLogic. Those two markets are also the places where homes are selling the fastest, Redfin says. The only bright spot for buyers could be the typical summer semi-slowdown. The Case-Shiller data is a couple months old, and local realtors have reported a rise in recent weeks in the number of homes coming on the market while demand seems to be easing from the spring rush, which usually happens this time of year.